Tom Gentile didn't get to be “America's #1 Pattern Trader” for nothing: he's earned it. And now, Tom's come up with a novel way of generating low-risk, high-reward investment income, whatever the markets are doing, through his remarkable Weekly Money Call tool. Weekly Money Call is Tom's proprietary system that crunches millions of data points on 200 of the most liquid stocks in the market, and predicts – with pinpoint accuracy – which stocks are about to jump… and highlights ways to trade these jumps for triple-digit gains (or more) in just four days or less. Now, five years ago these trades were impossible. 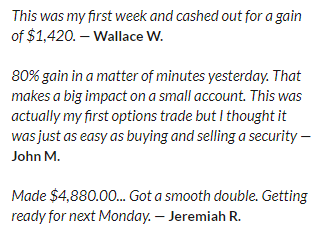 But now, Tom's showing readers how he uses this tool to capture gains of 100%… 200%… up to 500% every week through his remarkable Weekly Money Call research service. Tom's Weekly Money Call tool is one of the fastest – and lowest-risk – ways to make mo ney around. But remember, the Weekly Money Call is Tom's exclusive market analytics system. It's not available to anyone at any price. However, Tom has agreed to show you how you can benefit from the Weekly Money Call to capture triple-digit weekly gains – every week, through his elite research service where he publishes his findings and analysis using the tool. With step-by-step instructions, and accompanying training videos that show you exactly what to do, Tom will reveal trades that start on Monday and end on Friday – and could double, or even triple, in value in that short time… week after week. With Weekly Money Call, your next potential money-doubling trade is never more than a week away. This is your chance to learn how to trade like a Wall Street banker, secure a regular income, and make some serious money – fast. Something new… unusual… unconventional, even… is needed. When a stock is likely to jump – and the trade that turns this jump into triple-digit gains. And here's the best thing: Tom's Weekly Money Call identifies these trades every week, meaning you have the chance to be in on Monday and out on Friday – with double your money or more. This is the kind of reliable, low-risk income that only Wall Street's banks and hedge funds have had access to so far. But now, it's available to you too, and could lead you to gains of 100%… 200%… even 300% – week after week. And with Tom's clear-as-day analysis, trade instructions and weekly step-by-step training video, you too will could easily cash in on these every week.